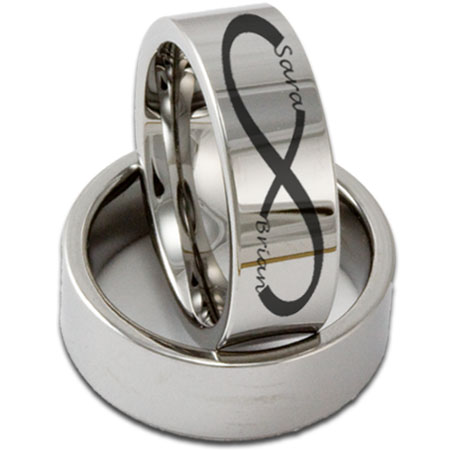 Pictured here is an 8MM Tungsten Ring with a stunning, intricate infinity symbol pattern that we will customize to have two names in the infinity symbol. This Tungsten Ring is extremely scratch resistant with a permanent personalized engraving. Show that your bond is everlasting by customizing this ring with two names. Name one is the upper left hand side of the symbol, and name two is the lower right hand side of the pattern. If you view the second picture you will see the orientation of Name One and Name Two. Like all of our Tungsten Rings this ring is Comfort Fit and is 100% cobalt free (we use a nickel binder to make a 100% hypo allergenic ring). Our exclusive couples infinity symbol can be added to many other ring styles as well - just contact us either by phone or email and we can help you set that up. 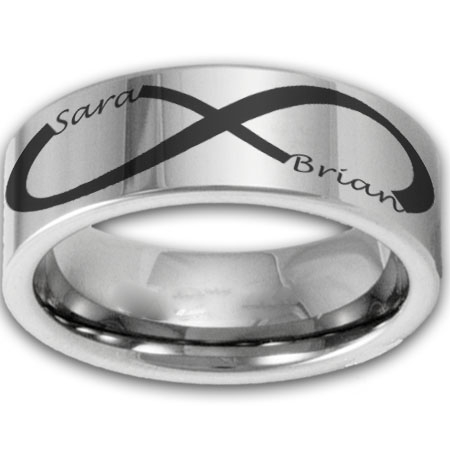 This ring can also be engraved inside with traditional engraving for an additional $20.00! Like all of our Tungsten Rings this ring is Comfort Fit and is 100% cobalt free (we use a nickel binder to make a 100% hypo allergenic ring). This ring is engravable on this inside as well for an additional $20.00 (traditional engraving), please check our custom engraving page for font samples. 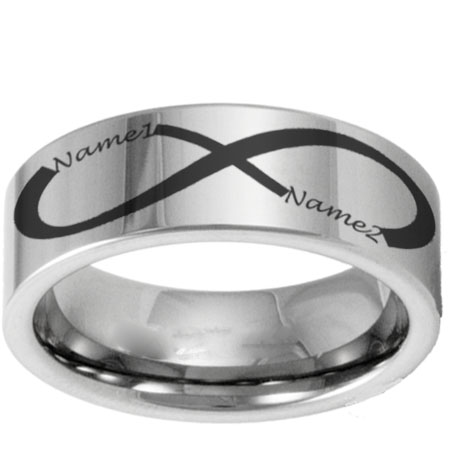 We encourage you to try this ring on before it is customized with your names. Once personalized we cannot return or exchange this ring.